Most people who know me are aware of the fact that I have a slight obsession with how things smell. I must sniff most foods before I eat them (especially new foods). If you let me into a Bath and Body Works store I can spend hours smelling lotions and bubble baths (and for a while... I worked there... boy was that heaven!) And candles? Let's just say I shouldn't be allowed to attend a PartyLite candle party with my wallet. 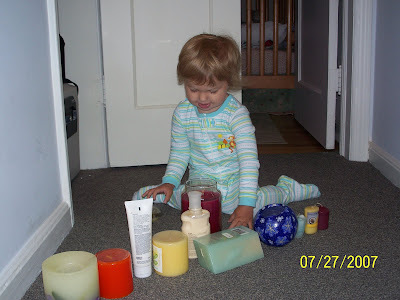 Since Zoe was born our candle stash has been dwindling. I barely burn them anymore. 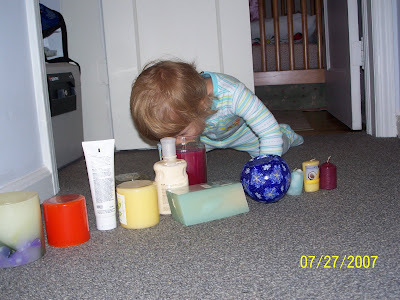 Something about a toddler and fire makes me a bit nervous... but still the candles and air fresheners are around. Recently Zoe found my small remaining stash. It looks like she may have inherited my obsession. She does this almost every day now. She opens the closet. 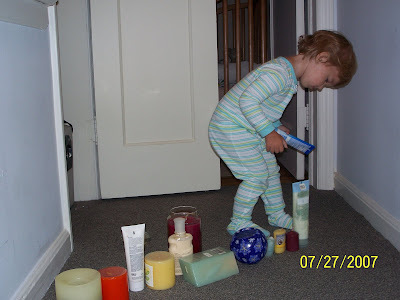 She carefully lines up the candles and lotions. She smells each one. She makes me smell them. 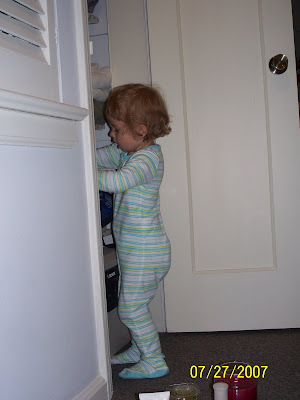 I am not allowed to put them away until she is somehow distracted and away from the hall and closet. Only then can I sneak them back in. Otherwise I hear "NO MOMMY, MY CANDLE! ", and she has to line them all back up. So... now I am not alone in my love of all things with pretty smells, especially candles.